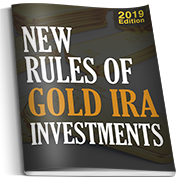 Throughout history gold has been the benchmark for evaluating the worth of currencies, and today gold bullion investments are universally recommended to hedge against declining value in stocks, bonds, and currency. Certified Gold Exchange, Inc. (CGE) has served licensed precious metal dealers and institutional gold traders since 1992. In 2001 we opened our doors to household investors enabling them for the first time to invest in gold bullion with the same security, confidence, and volume discounts previously afforded only to market insiders. Today CGE is North America’s premier platform for the exchange of precious metals. You may trade any certified gold product on Certified Gold Exchange, but to benefit from our volume business you should select from the Gold Bullion Coin and Gold Bullion Bar Investments listed below. Gold coins are the ideal choice for short-term gold bullion investment. These coins are legal tender and guaranteed for weight and purity by the country that issues them. The exquisite designs of gold bullion coins and the history behind them further enhance their value. Most gold bullion coins are 24 karat, 99.99% pure gold. They come in a great variety of weights that typically range from 1/10 ounce to 1 ounce, but by far the most commonly traded coins weigh one ounce. Instant worldwide liquidity and the ability to take physical possession give investors complete control over their gold bullion coin investments. The American Gold Eagle carries forth the tradition of the renowned double-eagle minted from 1907 to 1933. The obverse displays a stunning rendition of the iconic Augustus Saint-Gaudens’ full length figure of Lady Liberty with her flowing hair, torch held high in her right hand illuminating the way, and an olive branch in her left hand, outstretched in an offering of peace. On the reverse, in a dramatic design by sculptor Miley Busiek, an eagle descends clutching an olive branch, an offering to his mate and her hatchlings in the nest below. Unlike most other modern bullion coins, the American Gold Eagle is 22 karat, .9167 pure gold alloyed with silver and copper for superior durability. Gold Eagles are a true American product, restricted by law to contain only metals mined in the United States. American Gold Eagles are the best selling 22-karat gold coin in the world and they account for over 80% of American gold bullion coin investments. 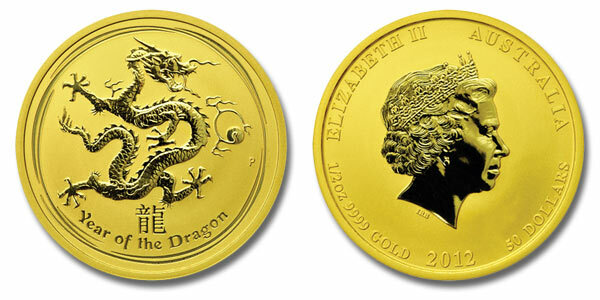 The 2000 Australian Dragon is fifth in the Lunar series of these modern collectible coins. These coins are beautifully struck in 24 karat gold and have an appearance rivaling that of proofs. Each coin in the series features one of the twelve animals of the ancient Chinese Lunar Calendar and with the exception of the 2-ounce, 10-ounce, and 1-kilo coins, each has limited mintage. The one-ounce coins have the lowest cap with production limited to 30,000 each year. Being the millennium coin, the Australian Dragon is of particular interest in the Lunar series. Having already reached its production cap, the one-ounce 2000 Gold Australian Dragon will no longer be produced. Although the coin is still legal tender, it is now considered collectible, increasing its value as a gold bullion coin investment. The Australian Kangaroo is a beautifully rendered 24 karat gold coin featuring a unique frosted design that gives it a two tone effect. Each year a different portrait of a kangaroo distinguishes the coin from other mintages. The unusual beauty of the Australian Kangaroo has made it a popular choice for gold bullion coin investment since first introduced in 1986. The Australian Kangaroo also premiered “jumbo” gold coins, topped by the largest gold bullion coin in regular production – weighing a full one kilogram. The 2001 Australian Snake is sixth in the Lunar series of modern collectible coins. Like the other coins in this series, the Australian Snake is beautifully struck in 24 karat gold and has an appearance rivaling that of proofs. The Australian Snake has not yet met the production cap so they are still available at near bullion prices, making them an excellent choice for gold bullion coin investment. Austrian 100 Corona gold coins (commonly called Coronas) were among the first products available for gold bullion coin investments when private possession of gold once again became legal in America. Austrian Coronas are .9000 fine (21.6 karat) and weigh .9802 ounce. The obverse bears the likeness of Franz Joseph I, Austrian Emperor from 1848 to 1916. The Austrian Coat of Arms, a double eagle with crown, is portrayed on the reverse, and Emperor Joseph’s motto, Viribus unitis (with united forces) is inscribed on the edges. All Coronas are restrikes dated 1915 and are no longer minted or promoted. Due to their relative obscurity, Coronas trade at one of the lowest premiums in the market. Bargain hunting investors need look no further than the Austrian Corona for their gold bullion coin investment. 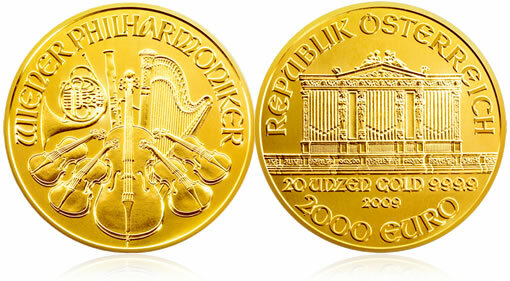 The beautiful Austrian Philharmonic is the first gold bullion coin to be struck in the Euro denomination. In honor of the Wiener Philharmoniker (Vienna Philharmonic), the obverse bears the Great Organ of the Großer Musikvereinssaal (Golden Hall), widely recognized as the most beautiful and acoustically perfect concert hall in the world. A collection of instruments on the reverse represents the orchestra. The Austrian Philharmonic has long been a favorite in Europe, and being the first gold bullion Euro coin its popularity for gold bullion coin investment has spread around the globe. Introduced in 1979, the Canadian Gold Maple Leaf was the world’s first .999 pure gold bullion coin. In 1982 the Royal Canadian Mint reset the benchmark for gold bullion coins to today’s .9999 fine. Perhaps only to prove it could be done, in 2007 the mint introduced a limited edition “5 nines” ( .99999) fine gold bullion coin. Due to their exceptional purity, Canadian Gold Maple Leafs are extremely popular for gold bullion coin investments and they have become the best selling 24-karat gold coin in the world. First struck in 1982, the Chinese Panda introduced the concept of modern bullion collectibles. Each year a limited number of Chinese Pandas are struck featuring a unique panda design on the reverse (with the exception of the 2001 Panda, which had the same design as the 2000 coin). The obverse portrays the Hall of Prayer for Good Harvests of the Temple of Heaven in Beijing with The Peoples’ Republic of China inscribed in Chinese on the top and the mint year inscribed on the bottom. In certain years minor variations in the design can be found that identify the originating mint. The universal love of panda bears, the novelty of Chinese bullion, and limited mintages combine to make the Chinese Panda an excellent choice for gold bullion coin investments. The 2010 Chinese Panda, portraying two panda cubs at play, might just be the most popular yet. The French Gold Rooster (Coq d’Or) is a very interesting and unique gold bullion coin. Although French Gold Roosters are considered rare – mintage ran from 1901 to 1914 – they are still plentiful and therefore quite affordable. (Actually, Roosters have been found with dates as early as 1899, but Gold Roosters minted prior to 1901 are true rarities.) Like the Corona, The French Gold Rooster is struck from 90.00% fine gold. Lady Liberty graces the obverse of the French Gold Rooster. On the reverse is a strutting rooster beneath the words “Liberte, Egalite, Fraternite” (Liberty, Equality, Brotherhood), the country’s motto since the French Revolution. All lovers of history will want to add the French Gold Rooster to their gold bullion coin investment portfolio. Introduced in 1967, the Krugerrand was the first legal tender gold coin struck for the purpose of gold trade. As the world’s largest producing nation, South Africa has circulated nearly 1500 tons of Krugerrands. 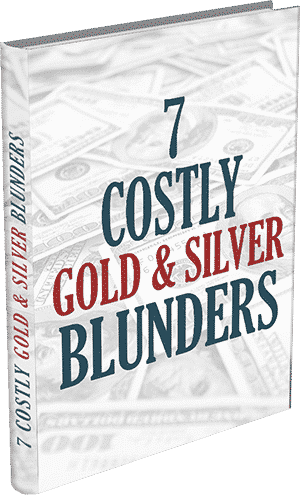 In the 1970s and 1980s the country engaged in an aggressive marketing campaign targeting Americans, who had only recently regained the right to privately hold gold bullion coin investments. South African Krugerrands are struck from 22 karat (.9167 fine) gold. A portrait of Paul Kruger, the last president of the Republic of South Africa, appears on the obverse, and a Springbok antelope adorns the reverse. The springbok (literally “jumping antelope” in Afrikaans) was the national symbol of South Africa under white minority rule. Gold bars are the perfect product for short-term gold bullion investment. 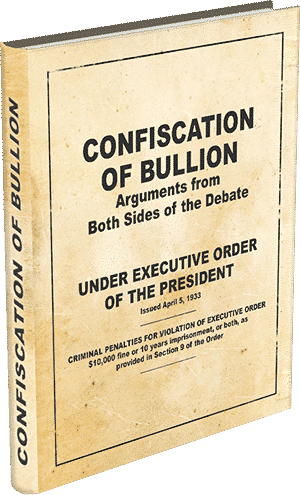 While gold bullion bars have the lowest premiums of gold bullion products, they are not classified as collectibles and they could therefore be susceptible to confiscation if the Government were to revert to the policies of 1933. Gold bullion bars are also sized for easy physical possession, and those bearing the mark of prominent producers such as Credit Suisse and Johnson Matthey enjoy the same instant worldwide liquidity as do gold bullion coins. Produced by one of the founding members of the London Gold Fixing, the Johnson Matthey name is well recognized and highly respected throughout the world. Johnson Matthey 24-karat gold bullion bars are considered by many to be the highest quality bullion available today. These bars come in a variety of weights ranging from one ounce to 16.5 pounds. For short-term strategies, Johnson Matthey is a name you can trust for your gold bullion bar investments. Also known as Credit Swiss, these 24-karat gold bars are backed by the prestigious Credit Suisse Bank of Switzerland and bear that highly respected hallmark. The mark alone guarantees recognition and acceptance everywhere in the world; their exceptional beauty and quality will only enhance their value for gold bullion bar investment. You can purchase any one-ounce bullion bar or coin listed above for only $0.99 to $1.99 over wholesale price, delivery included. In order to offer these exceptional prices we require a minimum purchase of ten ounces. There is never a fee to sell the gold you purchased from Certified Gold Exchange or any of our authorized dealers. The products listed here but scratch the surface of what is available for your gold bullion investments through Certified Gold Exchange. 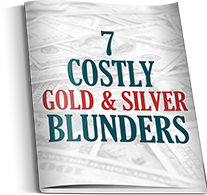 Although these represent the most popularly traded gold bullion bars and coins today, it is important to stay abreast of this ever changing market. 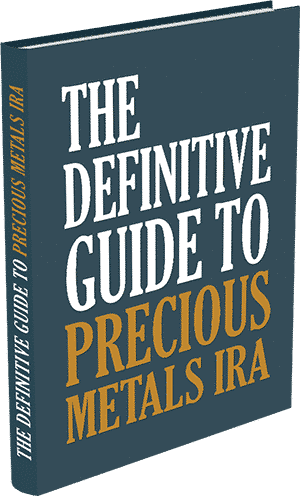 For up-to-date information on all of our gold bullion products, call 1-800-300-0715 and ask to speak with one of our certified gold specialists.